Have you ever had a friend or acquaintance that you might see every five or ten (even fifteen) years, and then for some inexplicable reason they disappear into the ether? When you next see the friend the conversation picks-up where it left off, without skipping a beat? The intervening years are important and they might filter into the new conversation, but immediately the old connection is solid again. The last time I saw David Fiuczynski he was with John Medeski and I am embarrassed to say that it was…eighteen years ago…it was a Lunar Crush back then. I have stayed in touch with Medeski and his compatriots, Martin and Wood, but I do not have any excuses for why I have not seen Fiuczynski in quite some time. So, after all these years, we reach again, this time on Planet MicroJam. This is where Brand X could have traveled after Moroccan Roll had they hit the teleport button to a laterally warped microtonal universe. I will say it now: I think this is a great and colorful album. This is one of those times when the connection for me is instantaneous, even when it is challenging. The reason is the interest in exploring, pushing the edges of musicality, and at the point where it seems like it might break apart, there is a sonic magnet that pulls it all together, and that is the Fuze. This time guitarist David Fiuczynski is microtonally jamming with Evgeny Lebedev on keyboards, David Radley on violin and Takeru Yamazaki on keyboards. Special guests also include Kenwood Dennard, Jovol Bell, Jack DeJohnette and Eric Kerr on drums with appearances by Trout (Fuze’s pup). The album opens with Micro Emperor (based on a fragment of Beethoven’s 5th Piano Concerto) and it slides and twists immediately into stimulating fretless territory. Mystic MicroJam starts with a lazy vamping rhythm, strums on the piano soundboard with twisting guitar and keyboards syncopating. After a speedy refrain, meandering violin joins and all peregrinate and then return to edgy indolence and then solos play off each other. Meditacion starts with playful chordal-quartertones by Fiuczynski and then drums, violin, guitar, bass and piano meander in a delightfully light-hearted banter. The piano at times harkens back to Corea’s work on Romantic Warrior. 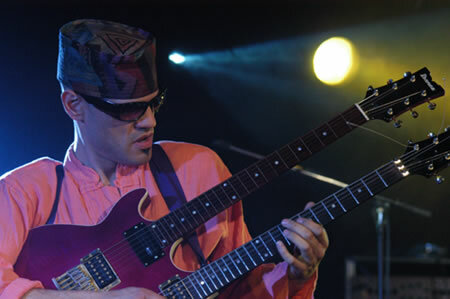 Sun Song is based on Sun Ra’s piece of the same name with polite melodic percussion and guitar on the edges and in between. As the piece continues, layers are added into a soothing fabric. Horos Fuzivikos is a spinning tarantella that does stop and then romp with a great spirit. Drunken Longing is a traditional Chinese interlude. Madoka Blue’s guitars and keyboards cascade then guitar, bass and drums have a layered conversation with strategic interjections from a treated piano—a bit like a herd of wrens in the trees. En Secreto’s trio furtively creeps and is based on a quartertone string quartet by Julian Carrillo. Green Lament is a subdued guitar solo. Apprehension starts by taking it easy, then the rhythm quickens, sound expands and dissonance appears. Takeru Yamazaki solos on violin, trading themes with guitar and piano and the structure switches between chaotic and rhythmic. There are times when John Goodsall-like phrases appear. Ragaku is a Far Eastern postscript and there are percussive stops emphasized with growls and barks by Trout. For some, this work will be an acquired taste (quarter and micro tones can take some getting used to…for dogs too), but if you are in for a tonal adventure, I say take the leap and turn it up. So David, let’s stay in touch more often, OK? I know; it’s entirely my fault. This entry was posted on July 8, 2012 by wajobu. It was filed under Uncategorized and was tagged with AffordableAudio, Audiokarma.org, Daily Audiophile, Darla, David Fiuczynski, HifiZine, jazz, Microtonal, Music, Progressive.